COMPARISON OF THE TIME REQUIRED FOR ULTRASONIC REMOVAL OF PREFABRICATED INTRARADICULAR POSTS. Emilia Karova 1 , Snezhanka Topalova-Pirinska. Department of Conservative Dentistry, Faculty of Dental Medicine, Medical University, Sofia, Bulgaria. Aim: To measure in vitro and compare the time necessary for ultrasonic removal of different prefabricated stainless steel and fiber posts, cemented with one and the same resin cement. Methodology: Thirty extracted human teeth were randomly distributed into three groups (n=10) – passive stainless steel, screwed and fiber ones. All posts were fixed with resin cement and lately treated with piezoelectric scaler, without water spray cooling, until their final removal. The time for definitive post dislodgement was measured with a chronometer. Results: Statistical analysis showed significant difference (p=0.001) between the mean time values for removal of tested posts. We found out considerable differences between measured time for passive stainless-steel and screwed posts (p=0.003) and passive stainless-steel and fiber posts (p=0.004) and insignificant for screwed stainless-steel and fiber posts (p=0.684). Conclusion: The shortest time for removal of prefabricated intraradicular posts was for screwed posts, followed by fiber and passive stainless steel ones. Karova E, Topalova-Pirinska S. Comparison of the time required for ultrasonic removal of prefabricated intraradicular posts. J of IMAB. 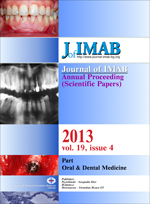 2013 Jul-Dec;19(4):426-429. doi: 10.5272/jimab.2013194.426. 31. Huttula AS, Tordik PA, Imamura G, Eichmiller FC, McClanahan SB. The Effect of Ultrasonic Post Instrumentation on Root Surface Temperature. J Endod. 2006 Nov;32(11):1085-7. [PubMed] [CrossRef].